Given the dizzying array of weight loss supplements and fad diets on the market today, it’s no surprise that finding one that works can be a challenge. At Parkhurst Chiropractic, we don’t guess; we assess to help you look and feel your best. We utilize a variety of testing methods to determine exactly what your body needs to optimize your metabolism. We offer a scientifically based approach that uses technologically advanced tools in conjunction with a custom designed program specifically for you. 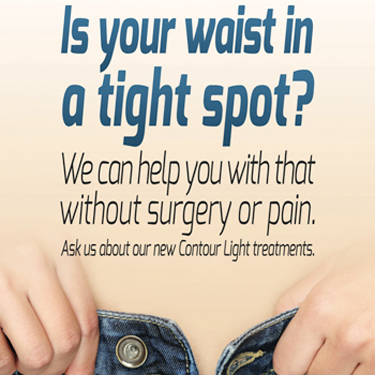 It’s Contour Light Body Sculpting, which uses the power of LED Light Therapy to target fat cells. After adipose (fat) cells are exposed to this specific wavelength, 99% of the fat is released from the cells. The result is inch loss and dramatic spot reduction anywhere on the body including the waistline, bra bulge, buttocks, thigh area and even the arms. This technique works anywhere there are excess fat deposits. You will complete a comprehensive metabolic assessment form as well as any testing to help our team identify what is keeping you from losing weight. Some of those conditions may include food sensitivities, adrenal fatigue, hormonal imbalance and blood sugar instabilities. Whole Body Vibration Therapy (WBV) assists your lymphatic system to eliminate toxins and fat from your system. WBV has also been shown to improve blood flow and tissue oxygenation producing a positive cardiovascular effect and muscle strength. Other benefits of WBV include increased bone density, bladder control, improved stability and balance. Our team of trained professionals will work with you to achieve your weight loss goals, whether you desire to lose 10 pounds or 100 plus pounds. We’re here to give you the tools and encouragement you need.